FFI Automation provides the best value motor for your OEM application. We will satisfy your requirements at a cost effective price. From AC induction motors to DC brushless motors, and as a profitable solution, our Perfect-Fit design helps you purchase precisely what you need. DC motors are divided into three classes, designated according to the method of connecting the armature and the field windings as shunt-series and compound wound. There are different kinds of DC motors, but they all work on the same principles. To understand what goes on inside a motor, here is an example When a permanent magnet is positioned around a loop of wire that is hooked up to a DC power source, we have the basics of a DC motor. In order to make the loop of wire spin, we have to connect a battery or DC power supply between its ends, and support it so it can spin about its axis. To allow the rotor to turn without twisting the wires, the ends of the wire loop are connected to a set of contacts called the commutator, which rubs against a set of conductors called the brushes. The brushes make electrical contact with the commutator as it spins, and are connected to the positive and negative leads of the power source, allowing electricity to flow through the loop. The electricity flowing through the loop creates a magnetic field that interacts with the magnetic field of the permanent magnet to make the loop spin. DC motors are available with different performance characteristics and accordingly are classified into Shunt/Series and Compound. DC motors have definite applications in today's industry. Each type offers specific characteristics and strengths, depending on the task at hand. Shunt wound motors are the most widely used as they have a linear characteristic of voltage and torque. A shunt motor has more constant and controllable speed over various loads while a series wound motor is used for high starting torque applications. This type of motor has greater torque capability. Compound wound motors are used for mixed load applications. Two desirable characteristics can be found in the same motor by placing both a Series field and Shunt field winding on the same pole. Thus we have, the Compound motor. Compound motors respond better to heavy load changes than Shunt motors because of the increased current through the series field coils. This boosts the field strength, providing added torque and speed. 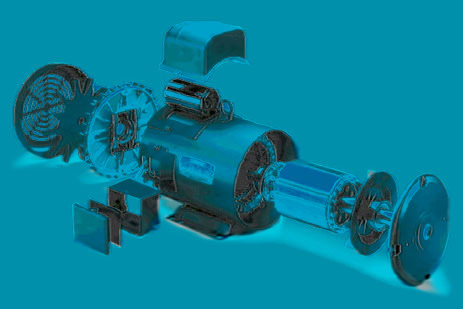 Repulsion motors are single phase motors, which have stator winding arranged for connection to source of power and Armature winding connected to commutator and the Brushes on commutator are short circuited. Brushes are so placed that the magnetic axis of Rotor winding is inclined to magnetic characteristic for changing the direction of rotation. Battery operated motors are designed for low voltage applications and are available in different voltage ranges, various characteristics & frame sizes. Low voltage High current D.C Motors working on Batteries are generally used in Railways, Material handling equipments and in the transportation industry. Torque motors are basically Series motors, which have a characteristic of taking heavy loads at startup. When the load on motor at start is less, motor runs at high speed, as gradually the load on the motor increases the speed of motor decreases, these characteristics are required in many Industrial Applications. SpecialiSation in the field of DC Motors has given us the ability to manufacturing motors of any capacity, range, characteristic and any other details. All FFI Motors, complaint with the industry. Requires little attention as there are no commutator or slip rings, yet operates with good efficiency. The most simple and reliable of all electric motors. Essentially a constant speed machine, which is adaptable for users under all but the most severe starting conditions. These motors are also used for varying-speed-service. Speed varies with this load, so that they should not be used where constant speed at each adjustment is required, as for machine tools. Used for constant speed-service requiring a heavier starting torque than is obtainable with squirrel cage type. Because of its lower starting current, this type is frequently used instead of the squirrel-cage type in larger sizes. These motors are commonly used for light starting and for running loads up to 1/3 HP Capacitor and repulsion types provide greater torque and are built in sizes up to 10 HP. This motor is used mostly in small sizes, where polyphase current is not available. Characteristics are not as good as the polyphase motor and for size larger that 10 HP, the line disturbance is likely to be objectionable. These motors are used with considerable advantage, particularly on large power systems, because of their inherent ability to improve the power factor of the system. Run at constant speed fixed by frequency of the system. Require direct current for excitation and have low starting torque. For large motor-generators sets, frequency changes, air compressors and similar apparatus which permits starting under a light load, for which they are generally used. This type of motor runs practically constant speed, regardless of the load. It is the type generally used in commercial practice and is usually recommended where starting conditions are not usually severs. Speed of the shunt-wound motors may be regulated in two ways: first, by inserting resistance in series with the armature, thus decreasing speed: and second, by inserting resistance in the field circuit, the speed will vary with each change in load: in the latter, the speeds is practically constant for any setting of the controller. This latter is the most generally used for adjustable-speed service, as in the case of machine tools. The shunt motor is probably the most common DC motor used in industry today. Components of the shunt motor are the armature and the field. The coils in the shunt field are composed of many turns of small wire, resulting in low shunt field current and moderate armature current. This motor provides starting torque that varies with the load applied and good speed regulation by controlling the shunt field voltage. If the shunt motor loses it’s field it will accelerate slightly until CEMF rises to a value sufficient to shut off the torque producing current. In other words, the shunt motor will not destroy itself if it loses its field, but it won’t have the torque required to do the job it was designed for. Common uses of the series motor include crane hoists, where large heavy loads will be raised and lowered and bridge and trolley drives on large overhead cranes. The series motor provides the starting torque required for moving large loads. Traction motors used to drive trains are series motors that provide the required torque and horsepower to get massive amounts of weight moving. Components of a series motor include the armature and the field. The same current is impressed upon the armature and the series field. The coils in the series field are made of a few turns of large gauge wire, to facilitate large current flow. This provides high starting torque, approximately 2 ¼ times the rated load torque. Series motor armatures are usually lap wound. Lap windings are good for high current, low voltage applications because they have additional parallel paths for current flow. Series motors have very poor speed control, running slowly with heavy loads and quickly with light loads. A series motor should never drive machines with a belt. If the belt breaks, the load would be removed and cause the motor to over speed and destroy itself in a matter of seconds. A combination of the shunt wound and series wound types combines the characteristics of both. Characteristics may be varied by varying the combination of the two windings. These motors are generally used where severe starting conditions are met and constant speed is required at the same time. When comparing the advantages of the series and shunt motors, the series motor has greater torque capabilities while the shunt motor has more constant and controllable speed over various loads. These two desirable characteristics can be found in the same motor by placing both a series field and shunt field winding on the same pole. Thus, we have the compound motor. The compound motor responds better to heavy load changes than a shunt motor because of the increased current through the series field coils. This boosts the field strength, providing added torque and speeds. If a shunt coil is added to a series motor at light loads (when a series motor tends to over speed) the added shunt field flux limits the top speed, eliminating self-destruction. Compound motors can be connected two ways, cumulatively and differentially. When connected cumulatively, the series field is connected to aid the shunt field, providing faster response than a straight shunt motor. When connected differentially, the series field opposes the shunt field. Differentially connected compound motors are sometimes referred to as “suicide motors,” because of their penchant for self destruction. If perhaps, the shunt field circuit were to suddenly open during loading, the series field would then assume control and the polarity of all fields would reverse. This results in the motor stopping, and then restarting in the opposite direction. It then operates as an unloaded series motor and will destroy itself. Differentially connected motors can also start in the opposite direction if the load is too heavy.